Posted by Ray Poynter, 24 March 2019. 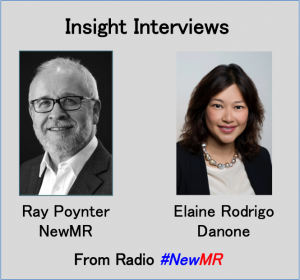 Radio NewMR is conducting a series of interviews with key players from client-side insight functions to create a clearer picture of the changes that are taking place around the world. In this interview Ray Poynter chats with Elaine Rodrigo, the Chief Strategy & Insights Officer at Danone. Click below to listen to, or download, the interview with Elaine. Elaine head Strategy and Insights, which looks after consumer, shopper insights, and data analytics. The team is split across in-country local business units, worldwide business units, and a small central team. The role of Strategy and Insights has changed because change (in both the business world and the wider world) has become constant. One area of change has been suppliers. There are now a large number who Elaine had not worked with or in some cases had not even heard of two years ago – and many of them are only three or four years old. Danone still works with large agencies, but the work is changing, getting closer to the customer and accommodating the speed of change. Partnerships are key, partnership to help smaller companies scale up, and with the larger companies to identify the people and approaches that can make a difference. The near future, two to four years, is going to provide more data, more technology platforms, and more DIY. The insight teams will move towards a planner-type role, where storytelling is key. There will be some data analysts, some experts in social intelligence – but the majority will be focusing on ‘humanising data’. There is a shift happening, away from focusing on tech, and towards focusing on people (but using tech to do it). Agencies need to stop moaning about smaller client budgets and lower cost research. The old world has changed. The focus is shifting away from proposing data collection projects, towards focusing on solutions. Research and insights is at an inflexion point, we can grasp the future, but we need to do it once piece at a time. Elaine joined Danone as Chief Officer of the Strategy & Insights function in January 2017. She is responsible for leading Danone’s continued efforts at keeping the consumer at the centre to drive sustainable growth, and achieve the company’s mission to bring health through food to as many people as possible #oneplanetonehealth. A key part of her role is to lead the transformation of the S&I function to be future-ready in today’s disruptive consumer-market paradigm. She is based in the Paris HQ of the company. Prior to joining Danone, Elaine built teams in both Global and Regional positions in Mondelez International. Joining the company in 2007 in Kraft Asia Pacific, Elaine led the regional Consumer Insights & Strategy team across 14 countries. 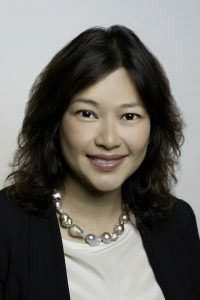 In 2013, she moved to a role in the Global Biscuits Leadership team, where she was responsible for insights across all markets including North America, Europe, and Developing markets with particular focus on China, Brazil and India. In her 9+ years in Mondelez, Elaine legacy lies in building high-performing teams that led the company on a path towards becoming a truly consumer-centric organisation that put consumers first. Adding the “science” to the “art of insights”, Elaine and her team also drove the use of advanced analytics for better marketing investment choices, and built shopper insights capabilities in countries. Elaine lives in Paris with her husband and two daughters, which is the fourth country she is lived in after Singapore, Australia and UK.